L to R: Nizoral anti-dandruff shampoo, Bumble and bumble thickening shampoo, Bumble and bumble thickening conditioner, Bumble and bumble thickening shampoo and Organix Repairing Awapuhi Ginger Instant Recovery Mask.. The Nizoral anti-dandruff shampoo is my life saver every winter! It helps me with dandruff that creeps up each time winter hits midwest! I will continue to re-purchase this product.. It costs $17-$18 for 7 fl oz.. 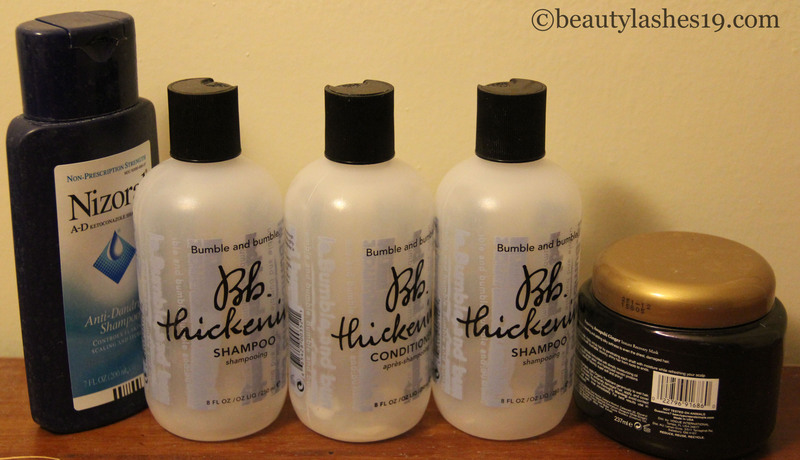 I wanted to try the Bumble and bumble line of hair care for a while now.. These are highly over-priced products at $24 for 8 oz of shampoo and $26 for 8 oz of conditioner.. The shampoo is good and it really helps with adding volume to hair.. However, I cannot justify the cost.. The conditioner is ok and can be replaced with other cheaper ones.. I will not be buying any more of these and will use up the remaining ones I have..
Organix Repairing Awapuhi Ginger Instant Recovery Mask was a good mask considering that it was only $8 for the tub of 8 oz.. I am not sure of any repairing properties but it sure made my hair soft and manageable and smelt good.. 🙂 I will consider repurchasing it in the future..
Empties – Face and Body products..
Project Pan 2019 – my first project pan!